Pirate McSnottbeard is back in another hilarious adventure for fans of Mr Gum and Barry Loser. Packed with comic art and more gags than you can wave a kipper at. The terrible Pirate McSnottbeard is BACK – and this time he's brought alien slug monsters. Forced to rescue their parents once more, Emilie and her brother Will blast off for an adventure in space. Faced with dragons, robots, vegetables and a battle inside a computer game, still nothing can prepare them for the most dreadful thing of all: Pirate McSnottbeard's singing... 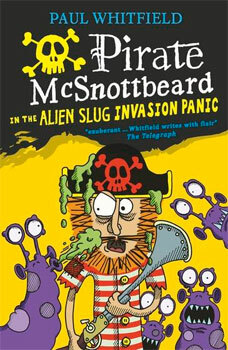 The second book in Paul Whitfield's Pirate McSnottbeard series, fully illustrated and packed with laugh-out-loud jokes. Paul Whitfield is a business journalist and author-illustrator living in Paris. The Pirate McSnottbeard series is his children's debut for Walker.